Never run out of propane unexpectedly!! Monitor the LP gas level in your tank accurately by ultrasound technology and monitor it with your smartphone or tablet via Bluetooth signal! Also Available for Larger Tanks Up To 1000 gal! Simply attach the magnetic sensor to the bottom of your tank and use a downloaded app on your mobile device for initial calibration and then monitoring of your tank level. Fuel tank level is updated every 5 seconds up to 200 feet of the sensor. Mobile app can support multiple tank monitors! A Bluetooth Remote Display Gauge is available for mounting inside the RV with the Dual-Tank TankCheck System. NEW!! Now the Mopeka Check WiFi Gateway enables you to also get tank level data on your Smartphone or any web enabled device! The Mopeka Check Gateway connects your Mopeka Check sensor to the cloud via your local WIFI router. Also works with Alexa and Google Home system voice commands. With the gateway in place, your tank level is continuously updated to the Mopeka cloud. The Mopeka app will then retrieve the tank level from the cloud if the sensor is not within range of your phone/tablet. So, you can check your tank level no matter where you are located! Great for vacation homes, RV parks, and gas companies! Add a Gateway to your TankCheck and get your tank level data online! TankCheck works on 20, 30, and 40 lb DOT cylinders, and on horizontal RV tanks (about 30" height max.). Standard sensors use a single CR2032 battery. XL sensors use a single CR2450 battery. Sensors mount to bottom of LPG Tank via magnets. Once activated, sensors electronically measure how much LPG is in Tank. Sensors communicate to the Monitor via Bluetooth Technology - no wires to mess with. Installs in minutes - simply sync devices and mount on the tank. Sensors and Monitor operate on "watch type" batteries - included in kit. Includes spacers to assist in mounting Sensors. The Bluetooth TankCheck Sensor is installed on the bottom side of a propane tank, and will connect with the TankCheck app on your smartphone or tablet and allow you to monitor the level of propane in your tank. The Mopeka Check XL Sensor works on larger tanks, from 100 lb (23.6 gallons) up to 1000 gallon tanks. Allows you to monitor the level of propane using the free Mopeka Check app on your smartphone or tablet. The LPG TankCheck is able to accommodate a variety of LP tanks and provides up to date tank level information. 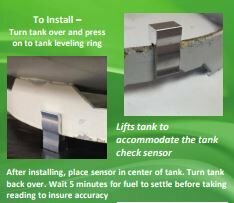 TankCheck's unique Sensor accurately measures the Tank LP level and communicates that information via Bluetooth or the TankCheck Monitor. Monitoring the Sensor with a Smart Device requires downloading the free App. Add a Gateway to your TankCheck and get your tank level data online! The Mopeka TankCheck app allows connection to multiple sensors, so that you can monitor as many tanks as you want! Or, propane level can also be monitored with the stand-alone Mopeka Check Double Monitor. The Mopeka Check app allows connection to multiple sensors, so that you can monitor as many tanks as you want! The Mopeka Check Standard Sensor can be connected to both the app and a standalone monitor at the same time. For larger tanks from 100 lb (23.6 gallons) to 1000 gallon tanks. The Mopeka Check Standard Sensors can be connected to both the app and a standalone monitor at the same time. Monitor is capable of reading two Sensors at the same time. You get tank level data on your Smartphone AND a local Display as well! Kit includes spacers to assist in mounting Sensors. Includes (1) Monitor, (2) Sensors, (6) Feet Pads and (2) Screws. Need a local display of tank level in addition to Smartphone access? Mopeka Check Monitor works with standard Mopeka sensors, and allows you to monitor the levels in one or two separate propane tanks. Please Note: Monitor only works with Standard Sensor. TankCheck Wi-Fi Gateway connects your Mopeka Check sensor to the cloud via your local WIFI router, and works with Alexa and Google Home system voice commands. So, you can check your tank level no matter where you are. Great for vacation homes, RV parks, and gas companies. Halo also provides the benefit of providing the space and improved wireless range when used with a standard sensor. Great replacement for lost aluminum spacers. Durable foot spacers made of aluminum, suitable for heavier tanks that are popular in the RV industry. And, its tight fit keeps it attached to the foot ring!